There is a great mix of new fiction and non fiction in this months top 10 reads for June. Click any title below to reserve your book now, as chosen by public library staff around Australia. Kim Leamy is approached by a stranger investigating the disappearance of a little girl from her Kentucky home twenty-eight years earlier. He believes Kim is that girl. As the mystery of Sammy’s disappearance unravels and the town’s secrets are revealed, this superb novel builds towards a tense, terrifying, and entirely unexpected climax. 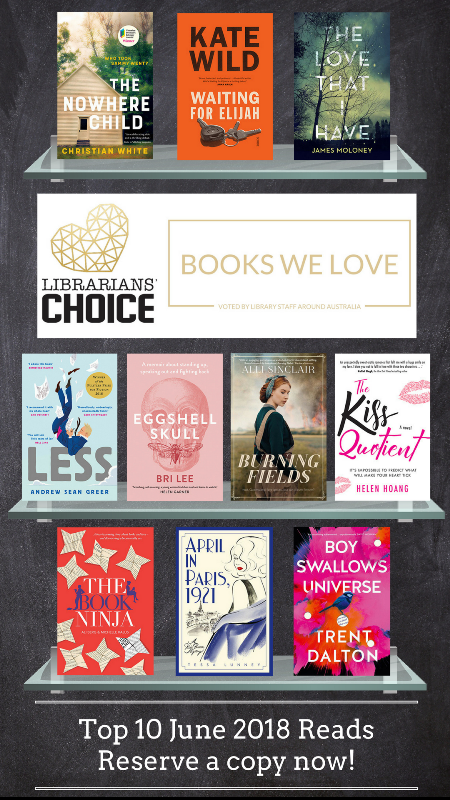 This entry was posted in Fiction, New Arrivals, Non Fiction, Recommended Reading, Staff Favourites and tagged Librarians' Choice, new reads, Staff picks by Parra Reader. Bookmark the permalink.